You know that you are what you eat, and you believe that getting enough of the right vitamins and minerals is important to staying healthy and staving off illness and the effects of aging. But do you know where to find those vitamins and minerals? There may be many more options than you think. For example, you know you need fiber, but you have hated oatmeal since you were a small child and your mother made you eat a bowl of the lumpy stuff before you went off to school. Well, oatmeal has come a long way since then. But if you still won’t touch it, you can get plenty of fiber in barley, bulgur, whole-grain flour, oat bran, or cornmeal. Or choose peas, artichokes, dates, raspberries or tomato products. Calcium is critical to maintaining strong bones, and milk and milk products are common sources. But dark greens such as spinach, collards, turnip greens and kale are also rich in calcium. Or try sardines or canned salmon (with bones). Cornmeal, wheat flour and soybeans also have plenty of calcium. And for dessert, try rhubarb. Oranges and grapefruit are obvious sources of Vitamin C, but they are not the only fruits. 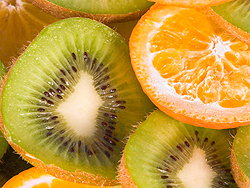 There is a ton of Vitamin C in papaya, kiwi and strawberries. And several vegetables also offer big servings of the cold-fighting vitamin; try sweet potatoes, peas, broccoli, Brussels sprouts and peppers. It seems that everyone – especially green tea makers -- is touting the value of antioxidants, which may help prevent cancer, Alzheimer’s disease, some heart problems – and which may hold back some of the effects of aging. To fill up on antioxidants, snack on berries (blue, black or cran), as well as prunes, apples and artichokes. Or have some beans, russet potatoes or a handful of pecans. And sprinkle on a little cinnamon. You can eat liver to get your daily dose of iron. But you can also eat clams, turkey giblets and beef. Vegetarians can chow down on soybeans, tomatoes, raw Jerusalem artichokes, and enriched rice and whole wheat flour. And don’t forget unsweetened baking chocolate. Folic acid promotes healthy cell growth, and it may help prevent some forms of cancer. You can find folic acid in beef liver and turkey giblets. Or try vegetables like lentils, black-eyed peas, okra, spinach, asparagus, chickpeas and navy, pinto or kidney beans. A glass of orange juice is also packed with folic acid.